Some people have a knack for going beyond the basics of interior design, blending what seem to be the perfect colors, furniture, art and patterns together to make a room or an entire home really "pop." The rest of us might have to work a little harder, but with time and research, you’ll have fun developing a style truly your own based on expert tips. Idea shopping allows for contact with professional arrangements first hand. You can spend as much time as needed to compare color schemes, furniture arrangements, bamboo blinds and so on, learning as you go. Flip through magazines and make a "clip file" of what you like. Take a showcase home tour. Visit furniture stores that feature whole room displays. Your reactions to various settings may surprise you. Maybe you thought you wanted a French country feel for the living room but now like the look of a neo-contemporary couch. Your mind’s eye might have always envisioned the dining room in fire engine red, but there’s just something about it being delft blue with white trim that soothes you. Click "Read More" to know more about decorating your home. The ideas you’ve collected will help you move forward with design. Think about what you want the room to accomplish. Maybe you’re redoing a family room that will be chock full of children, pets and peanut butter cracker crumbs. The fabrics, paint color, even the lighting for this action-oriented room will be completely opposite to the needs of a tranquil bathroom, just as the functional design of a modern home office will differ from a cozy guest bedroom. Design pros use a maquette to map out the dimensions of a room, outline the furniture, assign placement to windows, doors, outlets and other immovable objects, such as a fireplace, to know how and what to design. The maquette can be a simple piece of paper with the room drawn on it, featuring measurements of each area for quick reference. You can also place little shapes of furniture on the maquette to "move" at will as you work through your design. The size of a room or the features within it dictates basic interior design elements. If you have a small office, for example, an antique roll top desk smack in the middle of room will make the room feel crowded. A better choice might be a more "airy" piece of furniture. The proper use of scale applies to paint and fabrics as well. While rooms painted white appear larger, that doesn’t mean all small rooms should be white. A tiny nursery can be very intimate in forest green – but adding a wallpaper border of giant teddy bears may be a bit too much, making the room appear off-balance. The general rule is larger rooms accommodate bigger furniture and patterns well, just as smaller rooms work better with less furniture and reduced prints. The color wheel explains how to balance the use of color for what is known as a harmonious effect. Neutrals are forms of white, black, gray and beige. Neutrals are predominately used as the foundation of a room’s scheme, but can also be the primary decoration, then accented with color. Stores with a wall of paint swatches also have samples and guidebooks of how to blend colors and neutrals, as well as instruction cards that feature set color palettes that simplify color and neutral matching. Use these examples as shown or as inspiration for your own creations. While many believe there is meaning associated with color, what matters most is how the color makes you feel, how it reflects your personality and what mood you want for the room. Your focal point – the area that demands attention as soon as someone enters a room – can be just about anything, but remember the rest of room’s design will be built upon and around it. The focal point may be something you add, like a stunning piece of artwork from which you took color inspiration or a rug in an interesting shape. It may also be a feature of the room, such as a fireplace or a wall of windows overlooking a garden. Many people make the mistake of scattering their collections all around the house. But just as museum puts the Roman classics together in one area and Impressionist art in another, your collections should be centralized in a room to showcase the work. If you like Depression glass, place the pieces on one table or shelf that can be backlit by the afternoon sun. If your hobby is black and white photography, don’t hide your work in a dark hallway: dedicate one colored wall to your best photographs. Your collection of Pez dispensers might look cool lined up on a bookcase shelf. Highlighting your collection in one area creates visual interest in a room and speaks of your personality and interests. Now that you’ve learned some of the basics, let’s pull everything together. 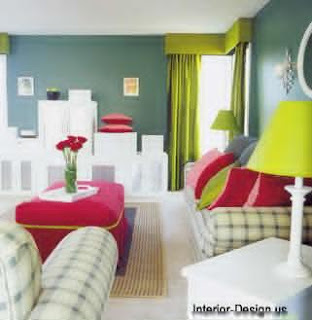 Repeat the main color throughout the room more than once. This attracts the eye and is the finishing touch. It might be something subtle, like a throw blanket, pillow or trim fabric on a chair. Add a pattern, print or texture. These offer both a visual and tactile thrill. Find one piece you love and display it proudly. Maybe it’s an antique bureau, a guitar mounted on the wall as art, a Tiffany lamp. Whatever it is, it will bring the room to life. Move items around the house. Sometimes the simplest design makeover is to try putting this over there. Don’t be afraid. Remember that a bad color choice can always be repainted, furniture is easily rearranged and windows are fine with curtains, shades or nothing at all.